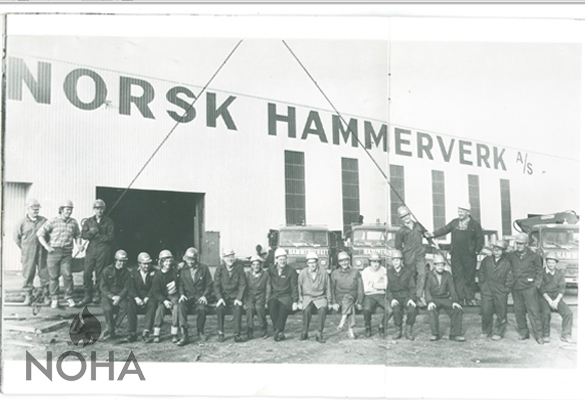 Norsk Hammerverk was founded October 23rd 1924 by Joachim Berner and Hjalmar Krogstad who both came from working at Stavanger Electro-Stålverk at Jørpeland. With their experience, they knew the market was in demand for forged products. After purchasing a hammerforge, Norsk Hammerverk (Norwegian Hammer Mill) was a natural choice of name for the company. In the 1930’s, times were difficult for the Norwegian engineering industry. Things improved when Norsk Hammerverk started importing steel. In addition, an outlet selling wallpaper and paints and colours was opened. Most of the shares had been bought by the company Gustav Aspelin, one of Norway’s leading suppliers of steel and construction materials. Gustav Aspelin later merged with Stormbull. The company often moved locations. After the war, negotiations with local authorities in Stavanger led to the company taking over a seaside property in 1948, formerly used by Stavanger Støperi & Dok. This was the first time all the company’s activities were situated at the same location. Fire Chief Evensen at Stavanger Fire Brigade came up with an idea, after a trip to England, to make a fire hose reel for semi-rigid hoses. At the time, it was common to install hose systems by using lay-flat hoses. The production started immediately with side members and water-bearing parts molded in brass. The goal was to sell 1000 units a year. The Radisson SAS Atlantic Hotel and the Domus-building downtown Stavanger still have hose reels from this period. In 1967 a Swedish NOHA branch was established with the Hjalmarsson’s as co-owners. In 1974 the name was changed to NOHA Forsaljnings AB, and is today part of Kidde Sweden. The efforts in Sweden were successfull and it was suggested to make new models to meet market demands. It was decided that sales were to go through the HVAC-industry alone and still is today. In 1973 an agreement was formed were Sandnes Aducerverk was to represent NOHA in Danmark. The company held a sales office outside Copenhagen and represented 7 Norwegian companies selling products to the HVAC-industry. Also Finland became a growing market, but competition from local manufacturers made it more difficult to settle there. The oil industry became, during the 1970’s, one of NOHA’s most important markets of suppression systems and fire extinguishers. One of the criteria NOHA had to meet to become preferred supplier was to arrange fire fighting training for offshore personnel. For several years NOHA ran a “fire school” where users were instructed in how to operate extinguishing equipment. The production at Norsk Hammerverk increased, resulting in the facilities becoming too small and outdated. In 1987 it was decided to build a new factory at Forus. All activities the company was engaged in other than fire fighting equipment, were moved to separate companies. 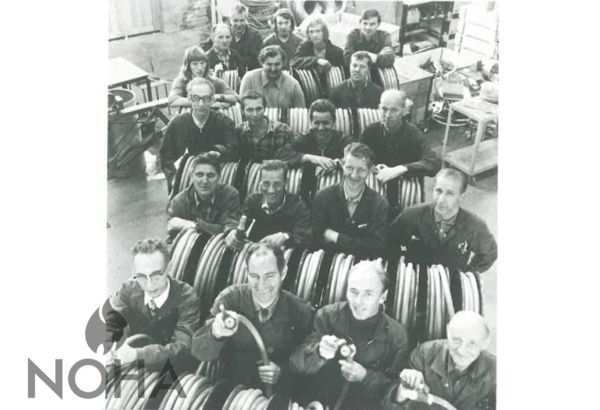 The administrative board approved the plans, and Norsk Hammerverk moved into a brand new factory early in 1988, a factory especially designed to manufacture fire hose reels and cabinets. I 1993 kjøpte NOHA Brannteknikk Sunde Autronica, et firma som hadde drevet med brannmateriell og brannservice siden 1970-tallet. Dette oppkjøpet markerer starten på NOHA som en leverandør av service på brannslokkingsutstyr i Oslo, Trondheim og Stavanger, og etter hvert også i Bergen og Kristiansand. Service av brannslokkingsutstyr er fortsatt en av NOHAs kjernevirksomheter. In 1993, NOHA Brannteknikk acquired Sunde Autronica, a company that had been engaged in fire safety and services since the 1970s. 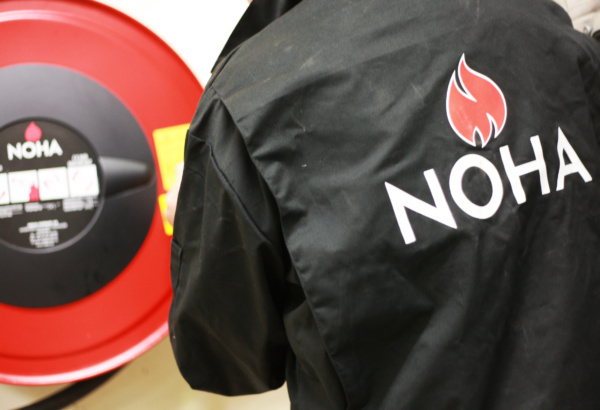 This acquisition marks the start of NOHA as a supplier of Maintenande of fire fighting equipment in Oslo, Trondheim and Stavanger, and eventually also in Bergen and Kristiansand. 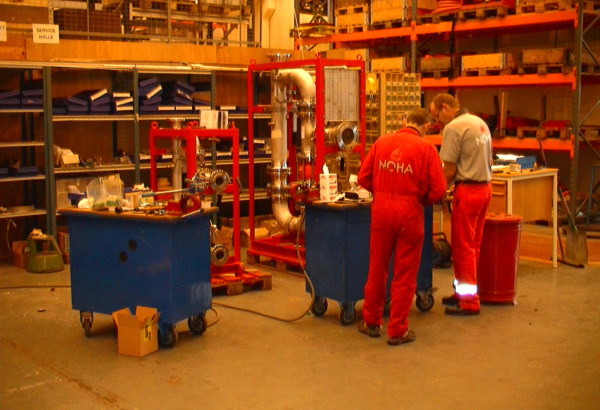 Service and Maintenance remains one of NOHA’s core businesses. In 1999 Norsk Hammerverk sold to the global British company Williams plc (later merged and became Kidde plc). The corporation acquired several fire fighting companies and chose NOHA as center of excellence for fire hose reels. As a result of the merger and internationalization, NOHA Brannteknikk and Norsk Hammerverk merged and changed names to NOHA NORWAY AS from 1. January 2000.Kidde plc was in April 2005 acquired by the American corporation UTC – United Technologies Corporation. In 2012 The Dutch SK FireSafety Group (SK) has acquired NOHA from UTC Climate, Controls & Security.